The goal is to move beyond two-dimensional screen based media to include Virtual Reality. This workshop allows users to build spatial thinking and computational thinking all situated in visual play. Virtual reality (VR) technologies are bringing back to the forefront the element of play in how we perceive and inhabit space. The Oculus Rift, for instance, is a virtual reality headset that is not just changing design visualization but could also change the overall design process. Anyone who has had the “Oculus experience” knows that this is much more immersive than 3D stereoscopic viewing or other VR predecessors. All of this is exciting, but much of the VR industry has placed emphasis on the end user to be only consumers of VR. The barrier to create VR content is high, and VR content aimed towards young children is not collaborative. The projects described in this packet reduce several barriers and makes VR content creation accessible to all. 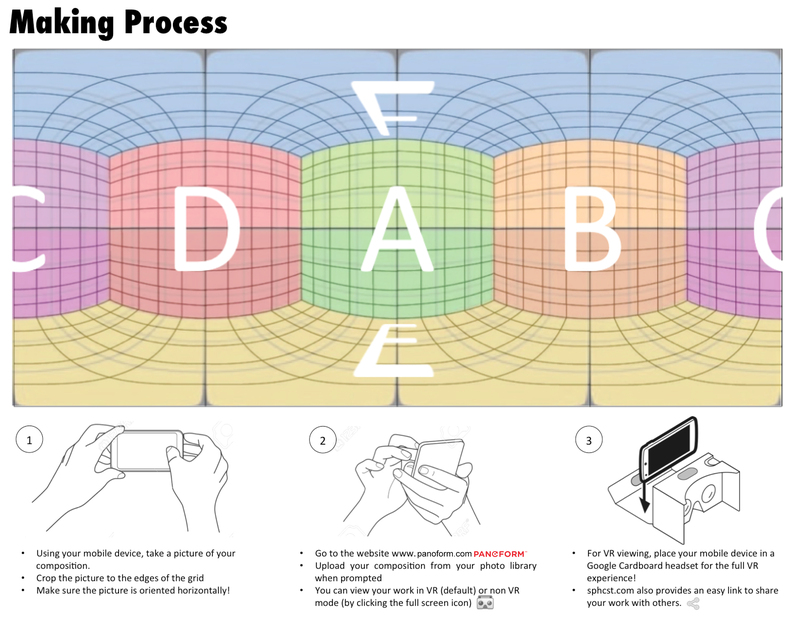 Design Thinking With VR begins with a base grid. In the world of design, the grid represents the foundation of all ideas. Grids can come in many forms; the one in this exercise is based off of an spherically unwrapped cube. In computer science this often referred to as UV mapping. We take the surface of a 3D surface and unfold it on a 2D plane. In the case of the grid pictured to the right, the surface being unwrapped is that of cube. The tangibility of these exercises brings VR into a domain of playful constructionism. Constructionism is an educational model coined by Seymour Papert. Papert built heavily on the constructivist learning model (which explains the likeness of the names). The theory purports that individuals learn by constructing their own learning experiences (as Constructivism suggests), but this is most effectively done through making and building. Spatial Typography, was the chosen theme for this exercise. Students learnedy graphic design principles and explored VR by creating spatial compositions driven by text. This exercise prompts the students to lay out a statement or passage to be read in VR space. Graphic Design has a strong precedent for using typography to frame space and amplify messages. Students used the grid to layout their compositions, then went through the iterative design process of viewing their work through Google Cardboard to see how the text looked in a spatial 360 environment. We used www.panoform.com (a free web app) to facilitate the translation of drawing into viewable VR all with simple smart phones. Students left the workshop feeling empowered with a seemingly low-tech yet very powerful way to express their thoughts and ideas in this emerging technology.